All power tools require careful use to prevent injury. However, there is often a wide gap between the appropriate techniques to ensure survival and those that are required for the best use. Without specific knowledge, it is quite easy to use a power tool in a way that might seem innocuous but in fact can do unsightly damage to your project that will give it an amateurish look. Belt sanders are no different in this regard. While their design and function may seem intuitive, there are still a handful of tip and techniques that every user should be aware to achieve the best results. If you are reading this, chances are you may very well have made one or more of these mistakes while using a belt sander. This guide will provide a series of steps and techniques, from before you use the power tool to after, to ensure that you understand how to use a belt sander correctly. If you are using a belt sander for the first time, you should still run through the preparatory steps to ensure that your use will flow unimpeded or without fail; however, it is very likely that many of these initial steps shall be performed in a perfunctory fashion simply to ensure that the belt sander does not run into any unforeseen issues. Always test your power tools beforehand to ensure that they are functioning properly. Make sure that the belt, pad, and other areas and components of the sander are free of dust or debris. Moreover, if you are working on a smaller piece of wood, ensure that it is securely fastened to a stable table or other such work area to prevent sliding as the belt sander’s torque pulls against the grain. It is imperative that you understand for which jobs a belt sander was designed and which it was not. Belt sanders are one of the more powerful types of sanders for consumer and commercial projects. Depending on the skill of the user and the sandpaper used, belt sanders are designed to accomplish anything from rough to fine finishing—though fine finishing is only advised for experienced users—as well as removing paint or varnish. While a belt sander does not carry the same risks of physical harm as a drill or saw, there are still safety precautions you should take when using the tool. Belt sanders are loud and extended use can cause hearing damage. As such, it is advised that you use professional ear plugs during use. Moreover, belt sanders will kick out dust from both ends of the belt. Generally, this dust is incredibly fine, but you should always wear protective eye gear. This helps prevent the dust from getting into your eyes, but it also ensures that, should a larger splinter of wood be shot at your face, you will not risk injury to your eyes. Finally, you should wear either a mask or dust respiratory to prevent any breathing problems arising from extended use. Of course, it should go without saying, never touch or leave long hair, loose clothing, or anything else connected to your body within reach of the belt sander. Once you have turned on the sander, wait for it to achieve maximum speed before use, then adjust as needed. High speeds are used for hardwoods and lower speeds for softer woods. The belt sander can generate a surprising amount of torque. As such, you should always use the tool with both hands with one finger on the trigger and the other on the forward handle to maintain control. Belt sanders can seem to have an intense degree of power for inexperienced users. One thing to keep in mind is that a quality belt sander will rarely require you to apply pressure when in use—unless the wood in question is incredibly dense. More often, however, the weight of the sander—and occasionally patience—is sufficient to accomplish the task. If you find the belt sander to be ineffective, you should almost always get a lower grit of sandpaper rather than apply downward pressure with your body weight. When used for finishing, you should gradually increase the grit’s grade as too much pressure can easily force an entire step to have to be redone at this stage. Since eyeballing the depth of the sanding can be tricky—even for experienced carpenters—it is advised that you use pencil or charcoal to keep track of the areas that you have already sanded. If sanding the top of a surface, simply mark the surface and sand until the mark has been sanded away. This may take numerous applications of the mark depending on how deep you must sand. This technique can also be applied for trimming except the mark will be placed on the perpendicular side of the surface being sanded. When rough sanding you may need to apply the tool at an angle to the grain, but whether you are rough or finish sanding, you should always make a complete pass where the sander goes past the end while remaining level to the surface being sanded. This rule does not apply when sanding uneven ridges in a floor, but you should still make longer, level passes. You can also affix the belt sander upside down to a stable table for stationary sanding—making sure that the sander is clamped securely in place. This is often used for smaller pieces of wood and to make rounded edges. Keep in mind, this can be a bit imprecise and it not recommended for beginners. In this position, the belt sander can also be used as tool sharpener for rough grinding of other tools like chisels or gouges. Once you have finished using the belt sander, there are a couple steps you should take to ensure that the tool will remain in top mechanical condition and to ensure that your preparatory tasks for its next use remain perfunctory and simply a matter of good habit. Always unplug and coil the cord after use. There are a couple knots that can make bundling the cord easy to store and prevent tangles. Once you have finished using the sander, remove the sandpaper and clean out any dust or debris that may have accumulated. Many carpenters simply leave the sandpaper in for convenience, but a build-up of dust can greatly decrease the lifespan of the belt sander. Finally, always store the tool in a dry, protected location—preferably one that does not suffer extremes of temperature. 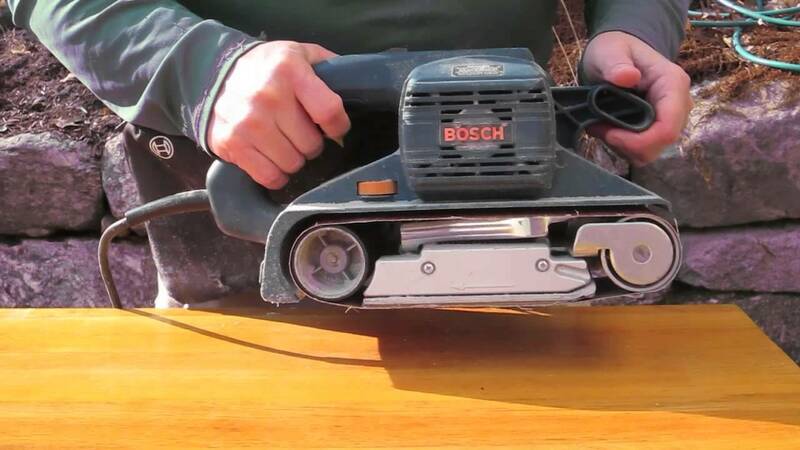 You should also double check that the belt sander is clean and free of dust or debris before its next use.